ON August 3, 1883, the first public electric railway in England began to run. This was a line, about a quarter of a mile long, which extended along the sea front at Brighton, from the Aquarium to the Old Chain Pier. Fifty-eight years had elapsed since the opening of the Stockton and Darlington Railway in 1825, and hitherto the supremacy of steam had remained unchallenged; but that August day saw the first practicable application to railways of one of steam’s most formidable rivals. Volk’s Electric Railway is thus not only interesting in itself, but is also of considerable importance in the history of British railways. That it was some years in advance of its time is shown by the fact that it antedated the City and South London Railway, the world’s oldest tube railway, by about seven years. A RAILWAY ON STILTS. A remarkable extension of Volk’s Electric Railway from Brighton to Rottingdean was opened in 1896. The carriages were carried about 23 ft above the rail level. The vehicle weighed about thirty-six tons and could travel at six miles an hour. The gauge was 18 ft. The length of the line was some 2¾ miles, and the car moved through 15 ft of water at high tide. The undertaking was the idea of Mr. Magnus Volk, who has remained associated with it for over fifty years. Mr. Volk’s interests included pioneer work in connexion with the electric telegraph, the telephone, electric lighting, and electrically-propelled motor cars. But he is perhaps best remembered for his promotion of Volk’s Electric Railway. Mr. Volk, who was Electrical Engineer to the Brighton Corporation, was responsible also for the Brighton and Rottingdean Extension, an electric line which ran through the sea at high tide. Both these lines will be described in this chapter. The Volk’s Electric Railway has carried over forty million people since its inception. In its present extended form it runs along the sea front near the Palace Pier to Black Rock, a distance of about one and a half miles. The track is slightly elevated above the beach, and at high tide it runs over the sea - a feature that gives point to the claim that it is “the only railway of its kind in England”. There are three stations, each of which exhibits placards drawing attention to the unique character of the line. The official opening day was August 3, 1883. During August Bank Holiday of that year, when the line was in operation for eleven hours, the single car in its possession is said to have carried about a thousand passengers and to have run an aggregate of fifty miles. As originally constructed, the gauge of the railway was only two feet. The small four-wheeled car was driven by current generated from a two horsepower gas engine, and ran at a service speed of six miles an hour. 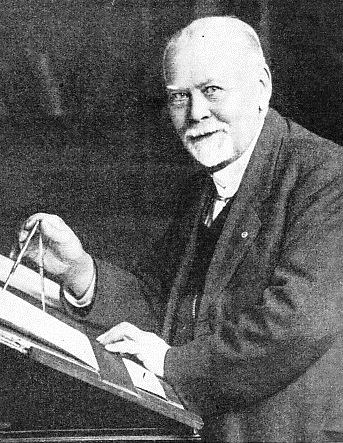 THE INVENTOR of the famous Electric Railway at Brighton, Mr. Magnus Volk. Mr. Volk has also carried out research work in connexion with the electric telegraph, the telephone, electric lighting and electrically driven motor-cars. Despite gloomy predictions as to its impracticability, the railway was a popular success from the first. The announcement of the opening of Volk’s Electric Railway attracted large crowds of spectators, the more especially as it was expected that the car would not work. In this the crowd was disappointed, as when started by the Mayor, the car with a heavy load moved away easily and without a hitch. Permission for the operation of the line had originally been granted for only six months, but this period was speedily extended. In the meantime the success of the undertaking had given rise to much local antagonism, especially on the part of the cabmen, boatmen, and persons engaged in the hay and corn-chandlering trades. Sleepers, sign-boards and other equipment began to develop the habit of disappearing overnight. Nature also took a hand a series of violent storms wrecked the line four times in a single summer. Although the damage was at once repaired in every instance, the work added greatly to the cost of running the system. Mr. Volk’s plucky fight, however, brought him both sympathy and offers of financial support, including the opening of a subscription list by a local newspaper that produced sufficient funds for the repair of the whole line. Thus Mr. Volk was enabled to keep the line open and to remain its owner, instead of abandoning it or handing it over to a company or public authority. The original permanent way was composed of flat-bottomed rails weighing twenty pounds to the yard, and spiked to longitudinal sleepers. These measured ten feet by nine inches by three inches, and were coated with tar. Shingle was used as packing. The gas engine that furnished the power was set up in an arch under the roadway opposite the Aquarium, developed nearly three horsepower in working, and drove a self-regulating generator giving current at fifty volts. A machine of similar size, but with magnets and an armature arranged in series, was installed in the car as a motor. From its earliest days, the railway attracted considerable attention in the press. A contemporary account refers to “the electric car, which (so Mr. Volk informs us) is a model of the interior of the deck saloon on a steam yacht; constructed of solid mahogany, plate-glass windows, a panelled ceiling with paintings of flowers and palms; blue silk curtains to the windows, mirrors, and so on. The exterior is precisely that of a first-class railway carriage, with the exception that the footboards are protected by brass rails”. This description is not that of the first vehicle, which, as will be seen from the illustration below, was hardly of so ornate a character. That was, however, scarcely to be expected, since the car, together with the dynamo and motor, was built, the generating plant installed, and the track laid, within eighteen days. This period must be regarded as remarkably short, when the pioneer nature of the whole work is borne in mind. Despite the opposition of interested parties who feared competition, the Brighton Corporation - very soon after the opening - gave permission for an extension from the Aquarium to Paston Place. This was speedily followed by a further extension to the existing terminus at Black Rock. Between August, 1883, and the beginning of the following January, a total of about 300,000 passengers had been carried, and the volume of traffic showed that the railway, even in its short initial form, had definitely filled a public need. In its present form the line, which is mostly single track, though equipped with adequate passing places, is laid on the 2 ft 8½ in gauge, being the only line in the kingdom constructed to that dimension. T he longitudinal sleepers have given place to the more customary cross sleepers, the running rails are of the Vignolles pattern, and the conductor third rail of channel section steel on earthenware insulators. The original little vehicle has been replaced by a total of ten cars, some closed and some open. The latter are known as “toast racks”, a design that greatly facilitates quick entrance and exit. The seating capacity of each car is thirty-two, but, since strap-hanging is allowed, as many as fifty people can be accommodated in a vehicle. FORTY MILLION PEOPLE have been carried on Volk’s Electric Railway since its inception. 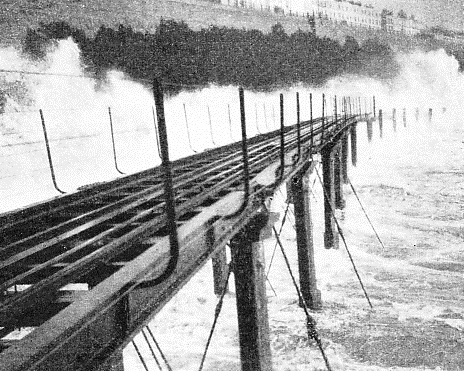 The picture shows a section of the track undergoing a fierce attack by a rough sea, through which the cars frequently have to run during the winter months. In spite of the small size of the undertaking, the line carries an average of well over a million passengers a year. It is a point of pride with the management that the five-minute service, which is maintained throughout the twelve months, has been operated for nearly fifty years. Moreover, although the purpose of the railway is primarily to cater for holiday-makers, it has also proved itself to be a valuable addition to the general traffic facilities of Brighton and Kemp Town. The generating plant has officially been described as being situated “in a cave in the sea wall”. The main equipment consists of a 90 hp motor generator converting the Corporation electric supply of 460 volts direct current to the track voltage of 160. There is also a small reserve 20 hp set. Two types of motor are in use, three care being of the original Siemens link belt-drive type, and the rest of modern tramway pattern, with single reduction gear, and generating from 7 to 8 hp at 750 revolutions a minute. All the transmission gear is fitted with either ball or roller bearings. The original generator was still in use as a motor in one of the cars as late as 1934. The Rottingdean Extension, which ran from Brighton to Rottingdean, was one of the most remarkable railways ever built. For, while Volk’s Electric Railway ran - and still runs - over the sea in places, the Rottingdean Extension ran through the sea. 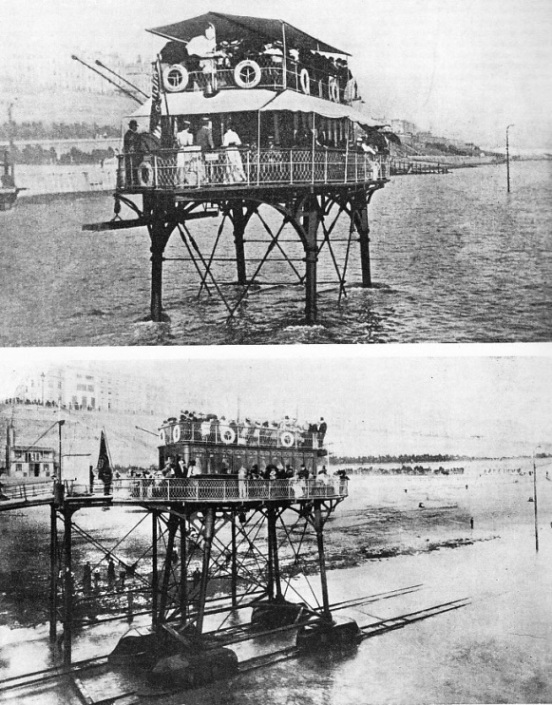 This extension, which received Parliamentary sanction in 1893, can best be described as a line whose tracks were laid on the shore, so that they were submerged at high tide, while the car, which resembled the midship portion of a Thames pleasure steamer, was supported by a combination of stilts and runners. At the time of its inauguration the Rottingdean line was generally known as the “railway on stilts”. It was planned to begin near Paston Place, and thence to proceed “along the beach and foreshore on the level between high and low water mark at a distance of about 100 yards from the cliff to the village of Rottingdean, terminating at a point on the seashore immediately to the westward of Rottingdean Gap”. A jetty or landing stage was provided at the Rottingdean end. This extended into the sea a distance of about 200 ft. The idea underlying this unique method of construction was that by taking the line a sufficient distance from the cliffs “a fine view of them would be obtained by the passengers”. The gauge of the Brighton and Rottingdean Seashore Electric Tram-road, to give it its full title, was 18 ft. This is not as formidable as it sounds, since there were two parallel tracks, each of the same gauge (2 ft 8½ in) as the present railway, laid at a considerable distance apart. The passenger accommodation was arranged in two tiers; on the lower level an enclosed saloon was surrounded by a four-sided railed platform; the saloon itself was surmounted by a railed deck. HM King Edward VII, when Prince of Wales, made a journey on this unique railway, and the fact was recorded by a brass plate in the saloon. The length of the line was about two and three quarter miles, and at high tide the car moved through 15 ft of water. The work of construction began immediately Parliamentary sanction had been obtained, and was carried on continuously, despite morning and evening tides. During the winter in which operations were undertaken, construction was greatly hampered by intense cold, which caused the sea water to freeze on the groynes that are so characteristic a feature of this part of the South Coast. THE AQUARIUM STATION on Volk’s Electric Railway. There are three stations on the line, which carries an average of over a million passengers a year. It would, of course, have been out of the question to lay the tracks on wooden sleepers, and, as the bed-rock is chalk, the rails were laid on concrete blocks. These were formed by cutting square holes in the chalk, pouring in the concrete, and boxing it round until each block stood at the necessary height above ground. The rails were fastened to these concrete blocks, which were spaced at intervals of 3 ft, by means of steel clips and bolts. So that cars might run over a track of the maximum security, stability was further assured by the lavish provision of fish-plates and tie-rods. The car, which had accommodation for about 160 passengers, was 50 ft long and 22 ft wide. According to a story current at the time, the Corporation of Brighton refused to grant a licence to the undertaking unless the structure carried a lifeboat. The vehicle was accordingly provided with a lifeboat to meet the requirement. The four legs, or stilts, on which the vehicle was supported were steel tubes, through which passed shafts acting on the wheels. Two of these shafts, which were actuated by bevel gearing, conveyed motion to the wheels, while the other two worked the brakes. Each of the legs terminated in a four-wheeled bogie, shaped rather like an inverted rowing-boat, and having in front a metal contrivance for keeping the rails clear of sand, seaweed, and other obstructive matter. Two of the bogies ran on one of the two tracks; the other two ran on two parallel tracks. The bevel gearing was encased in grease boxes, with the dual object of ensuring adequate lubrication and keeping out the sea water. Each driving bogie was actuated by a separate electric motor, situated on the main deck of the vehicle, and current was fed to the motors by overhead wires, the construction of which caused considerable controversy at the time. The current was generated on the Rottingdean pier terminus, the plant furnishing 120 hp at 500 volts. The Brighton terminus consisted of a jetty, with waiting-rooms for the accommodation of passengers. The bottom of the car was some 23 ft above rail level, and the vehicle weighed about 36 tons with motors, and could travel at six miles an hour. After the approval of the Board of Trade had been obtained, the line was opened in September, 1896. It attracted considerable attention in the Press. One journal, which referred to the attractions of “a coasting trip, without the terrible internal disturbances by which such aquatic jaunts are not infrequently accompanied”, characterized the undertaking as “about as fin-de-siecley as anything that can be imagined”. Another newspaper, in a leading article called “Trains on Stilts”, asked its readers to “consider the possibilities and potentialities of this astonishing railway”, which “will, of course, revolutionize sea travel as the locomotive revolutionized land travel. In a short time we may expect to see a railway running from Dover to Calais . . . and later on, when experience has bred confidence, will be opened the London, New York, and Melbourne Railway on Stilts. . . . The great ocean liners, reduced to mere cargo boats, will be crawling along to port and starboard, steering by the light of our flying windows”. This enthusiastic leader writer even went so far as to predict the construction of railways on stilts to “the moon, Mars, and other outlying places on the firmament”, and “the sun himself will have a trunk line”. Unfortunately, these predictions failed to materialize, and the Brighton and Rottingdean Tramroad itself had only a short life. Shortly after its opening it was badly damaged by the gale that destroyed the Old Chain Pier. The promoters were, however, not daunted by a mishap on the possibility of which they had no doubt reckoned, and the line was repaired and reopened. Changes in the seashore, however, eventually put a stop to working, and the track had to be taken up. So ended the life of a railway that remains unique in the history of transport. But it has been pointed out by Mr. Volk that the construction was of a purely experimental nature, and that if the money had been available for an improved type of car, much better results would have been obtained. 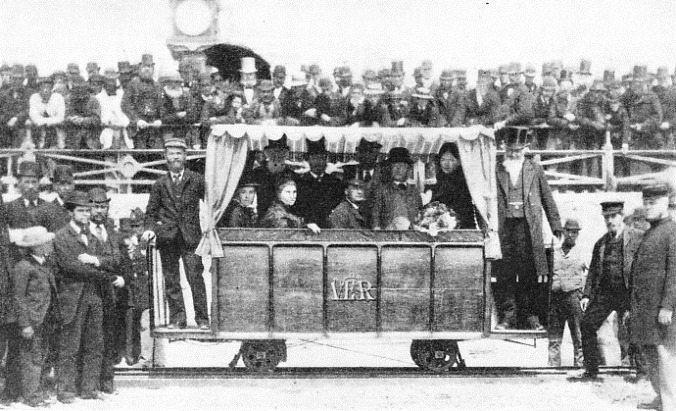 THE OPENING CEREMONY of Volk’s Electric Railway on August 3rd, 1883, attracted great interest. The car was started by the Mayor, who travelled on the first journey. The inventor, Mr. Magnus Volk, can be seen as conductor at one end of the car. 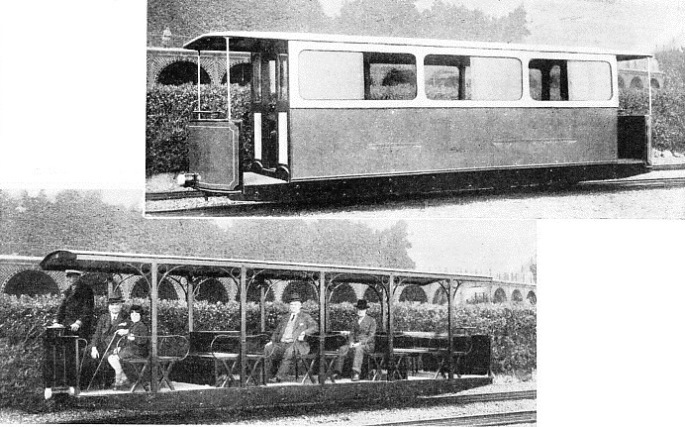 SUMMER AND WINTER ROLLING-STOCK on the modern Volk’s Electric Railway, During the winter the closed-in saloon type is run. The gauge of the present railway is 2 ft 8½ in and is unique in Great Britain. There are ten cars on the line and a five-minute service is maintained throughout the year. The seating capacity of each car is thirty-two.